If you’re seriously injured in Richmond County or nearby, you could find yourself being transported in a helicopter like this one. Kelly Keener, with PHI Air Medical, spoke to the Triad on Oct. 27 about how it works, and how a membership can help you cover costs. PHI is a division of PHI Inc. (Petroleum Helicopter Inc.) The company started in late 60s shuttling oil workers from Gulf Coast out to rigs. The owner had an incident with an ill family member who needed a medevac transport, and he decided that PHI had so much experience with helicopters, they would try to connect with EMS to be able to provide a vital service to communities. 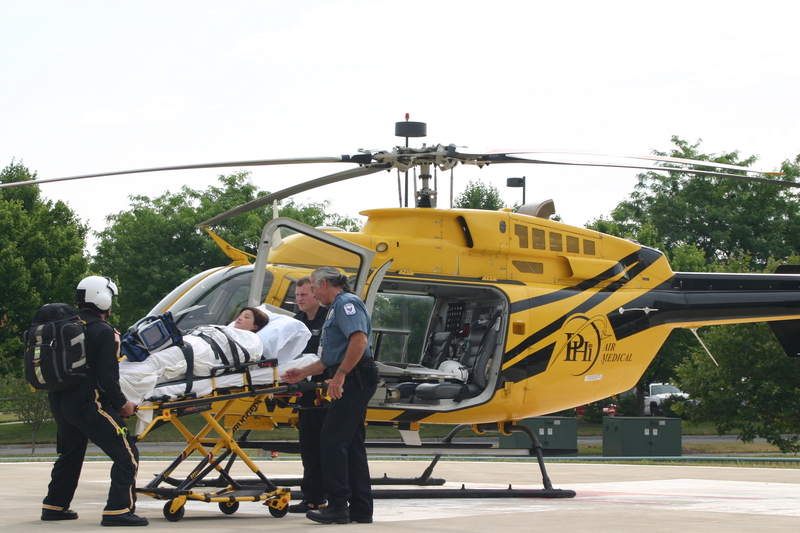 PHI is based all over the U.S., providing air ambulance helicopter transport for emergency situations. The fleet has about 100 medical helicopters, operating from 85 bases and transporting some 30,000 people each year. Community-based helicopters—such as those in Maryland and Virginia—are based primarily in rural areas with long ground transport times, and have no allegiance to a particular hospital. PHI owns the aircraft, hires and trains pilots and medical crews. Each crew includes a critical care paramedic and a critical care flight nurse. If the flight is a transport from one hospital to another, the doctor determines what hospital you go to. If PHI responds to an accident scene, there are strict protocols for determining what hospital the patient needs to go to. The closest base to the Northern Neck is Fredericksburg’s Shannon Airport. Also in Virginia are Manassas, Leesburg ,Front Royal and Weyers Cave, outside Harrisonburg. PHI also conducts quarterly campaigns to promote health and safety awareness: heart health, distracted driving, breast cancer, pre-prom accident education. The company also does medical training outreach, such as annual education days in Front Royal for EMS providers, focused on topics that are hard to get elsewhere. There are two types of transports: (1) from an accident or medical emergency scene, where EMS responders decide whether helicopter transport is needed; and (2) inter-facility transports from one hospital to another. For $50/year per household, PHI will transport you at no out-of-pocket cost to you for medically necessary flights. For example, a flight from Rappahannock Hospital in Kilmarnock to VCU in Richmond could run several thousands of dollars. Membership travels throughout the U.S., where PHI serves the community. There also are group rates, at $40/year each for groups of 15 or more. The aircraft is basically a “flying ICU,” Kelly said, with all the latest technology available. The fees not only provide members with assurance that they’re costs are covered if they’re transported by a PHI helicopter, but also helps PHI train local EMS providers to work with the helicopters, train crews to stay up-to-date, and maintain the fleet. PHI Cares has no reciprocity arrangement with other transport providers, because it’s not an insurance plan. There is, however, an insurance plan operated by competitors called Life Shield Alliance, with a limited plan for $100/year. Other transport vendors are Air Methods Holdings, which operates LifeEvac helicopters based at VCU and West Point. Richmond County EMS has an agreement that events north of Route 360 will be covered by PHI; south of the highway will be covered by LifeEvac, which is closer. But PHI will be ready in case LifeEvac is not available. For more information, contact Kelly Keener at PHI Air Medical: 703-661-0935 or kkeener@phihelico.com. This entry was posted on September 30, 2015 by jabercrombie702.